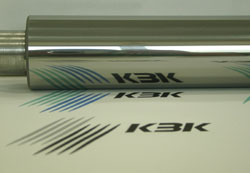 Kurashiki Boring Kiko (KBK) is certified ISO9001:2000 in 2005.
to provide our customers with excellent products. We are the company which is capable of meeting customer needs which upgrade day-by-day as we employ integrated production system from development, designing, surface modification (thermal spraying), machining, and to finishing. We wish to supply 10～50 pieces of products per month as one lot. 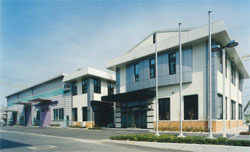 We can solve your surface treatment problems quickly. Please feel free to contact us at anytime. The thermal spraying, is certified as an alternative surface treatment technology, which replaces chrome plating, by the aircraft manufacturers such as Boeing and Airbus. In the past, chrome was plated onto the parts such as landing gears, but now the thermal spraying is adopted. Currently in many cases, the thermal spraying is utilized as it is environment-friendly and high quality. 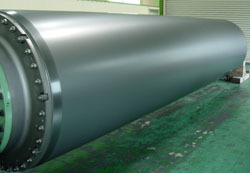 ・Wear-resistant, corrosion-resistant, fatigue-resistant which have advantages over hard chrome plating. It is possible to apply various different substrate such as titanium, aluminum alloy, and plastics. For aircraft engine components, countermeasures to heat are extremely important. KBK provides our customers with excellent thermal barrier coating which meets every specification of engine manufacturers. 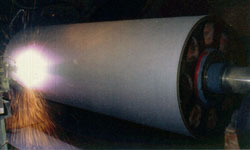 Plasma spraying forms coating of high melting point materials, such as ceramics and cermet.